Although attention must be paid to the flood of people using the web from their devices, engagement happens more in well-designed apps than in responsive websites. Any decent website firm should be able to create a responsive website. The promise of responsive is capturing the number of people using mobile devices. Leads, referrals and client collaboration all come from apps because apps are designed for simplicity. Apps make use of the phone functionality to get real estate consumers where they want to go faster. It’s normal to pull out phones while standing in grocery lines, at sporting events and in front of a house for sale. Ultimately, this means we are logging on multiple times a day, and these “mobile moments” as Google calls them, add up to big usage numbers. 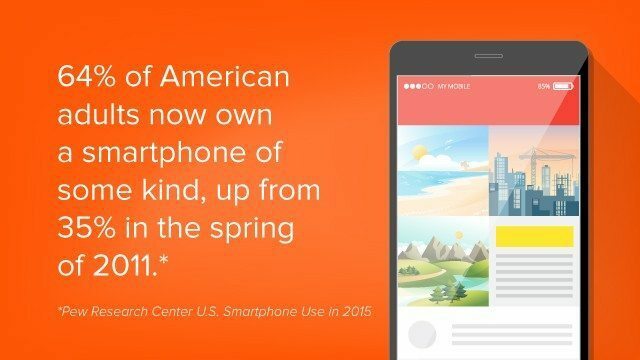 Mobile moments add up to big usage numbers daily. First, consumers are using mobile devices more and more because it gets them the information they want right away from a device they always have with them. Second, though attention must be paid to the flood of people using the Web from their devices, engagement happens more in well-designed apps than on responsive websites. Mobile apps are fast and to the point. They are quickly opened with a tap on your phone after you download them. Therefore, if you are a broker or an agent, your thinking should be centered around how to capture mobile customers in 2016. Responsive websites: A website that morphs to fit the screen size of your phone and makes it easier to read. Reactive websites: Adds smarts to a responsive website. For example, a reactive website will only deliver information in a responsive format that is appropriate for the device you are on at the time. Not everything on a desktop is relevant on a mobile phone. Mobile apps: Apps are purchased from an app marketplace, such as the Apple App Store or Android Google Play. They use the features of the phone, such as GPS capabilities, cameras and push notifications better than a responsive website can. These are also called “native” apps because they are made for phones specifically, which is why apps generate more engagement with their visitors than responsive websites. First, get a responsive or reactive website. Any decent website firm should be able to create a responsive website. The promise of responsive is capturing the number of people using mobile devices. The problem is that responsive sites are unwieldy to use when searching for property for sale. If you are an agent or a broker who is not looking to spend much money, a basic responsive website is the bare minimum you should have to get your message across. If you have a top custom designer, they can create more reactive solutions. Just be aware that even mega-companies such as Facebook haven’t cracked the code on getting engagement entirely from responsive websites. A good app is one that you can share easily with your prospects and customers. It should be solely branded to you, with IDX listings. You can get a great app for under $500 a month if you are a small to mid-sized brokerage company. Your app will be in Google Play and the App Store.